Hey friends! Long time no see! I have no excuse other than some other things have had to take priority, and there aren't enough hours in a day. But I think I am back. I think I said that before, but I am pretty positive now. I am running 2 businesses, caring for my grand littles a few days a week and trying to keep up the blog and website. Oh then there is being a wife, and having household duties, and all of that stuff! We have had weddings, and baby showers and lots of photo shoots, it is crazy but I refuse to give up the things I love, so even if it is between 2 and 6 a.m., I WILL keep things up! So speaking of baby showers, I held a surprise one this week for my niece Maegon. She is my oldest niece, she is only 5 years younger than me, so she is more like a little sister. She is pregnant with her first baby, and this was something she was told may never happen so I wanted to celebrate big! She lives out of state and was coming in for another nieces wedding and it was the perfect time! I wanted to do something fun for the favors, as I themed her shower "The Jungle Book". Her favorite color is orange (good choice, so is mine). So I filled brown paper bags with banana runts, gummy bears, coconut jelly beans, animal crackers, bright green sixlets (needed the color!) 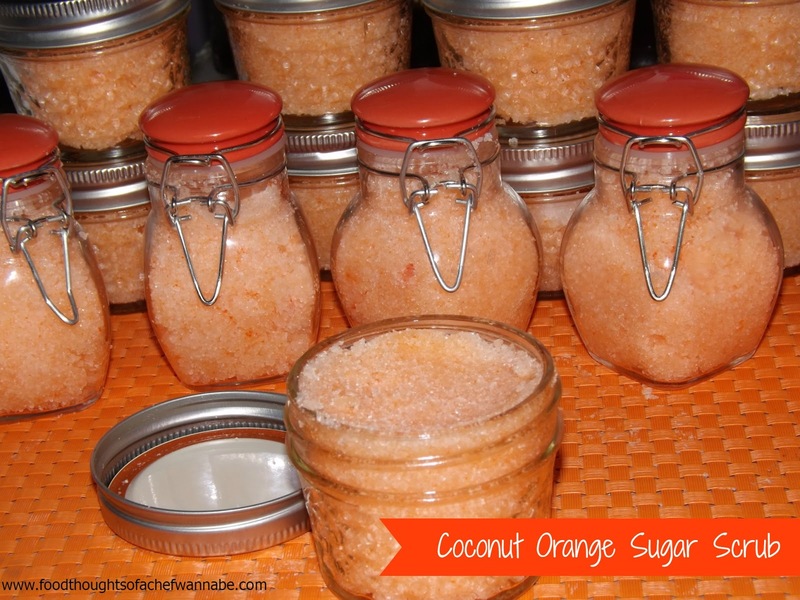 and this sugar scrub. Lots of you said you didn't mind seeing a recipe that wasn't food, although, you technically could eat this so if you have little ones and like to keep things natural, well, this is safe. There are 5 million recipes for body scrubs out there. Many the same and many different. I had some coconut oil I wanted to use up, and I wanted a sugar based scrub and not a salt one. By the way, this is an awkward disclaimer, make sure you use this on your body and keep it away from, umm..... your "undercarriage" as it is sugar based which feeds yeast and well, I will let you google it, if you don't know what I am sayin! OMG, that was so weird to type in a food blog. Let's hurry ad just move on. Act like it didn't happen. This made about 10 half pint jars, but if you are using just for yourself, store in an airtight container and use it before self tanning, after being out in the sun, or just to pamper your skin it smells out of this world and it works amazing! My mix and match was a hit, so here we go! Literally just put this all in a bowl and start mixing. It might take a couple of minutes but it will all mix beautifully. 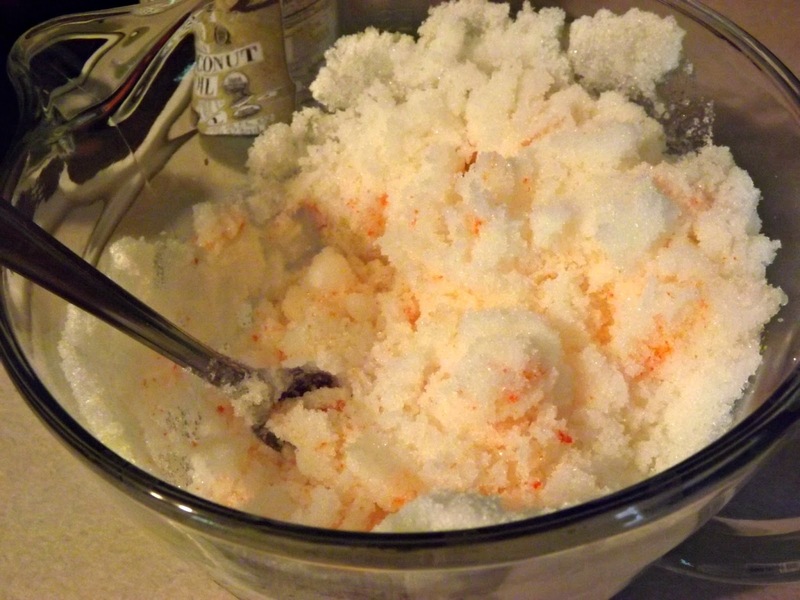 The addition of the food coloring will not affect your skin at all. When you have the color consistent you are basically done! While I can't be exact on the shelf life, I am sure that it is at least several weeks and honestly, it won't be around that long anyway!!! Enjoy soft, exfoliated, delicious smelling skin! !